Onions are such a versatile vegetable. I use them almost every day in recipes. I always seem to have onions growing in various places in my house and garden. Growing onions indoors can be done quite a few different ways. 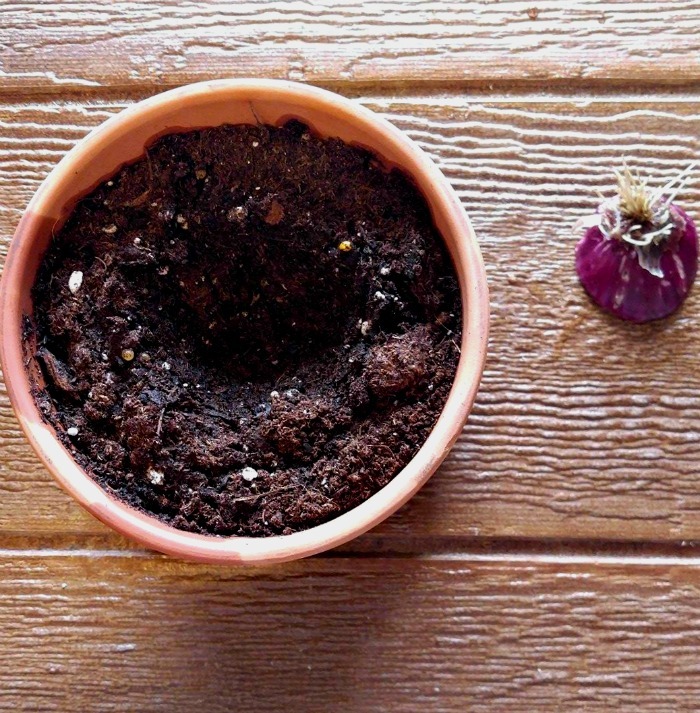 Growing onion bottoms is a great way to use parts of the onion that would otherwise end up in the trash. This project can be done with any type of onion. Spanish, yellow, white and Vidalia onions all work. Scallions and spring onions will work too. The main thing that you need is an onion bottom. I chose a Vidalia onion today. I made an oven roasted chicken recipe and just saved the bottom part which still has bits of roots on it for my project. 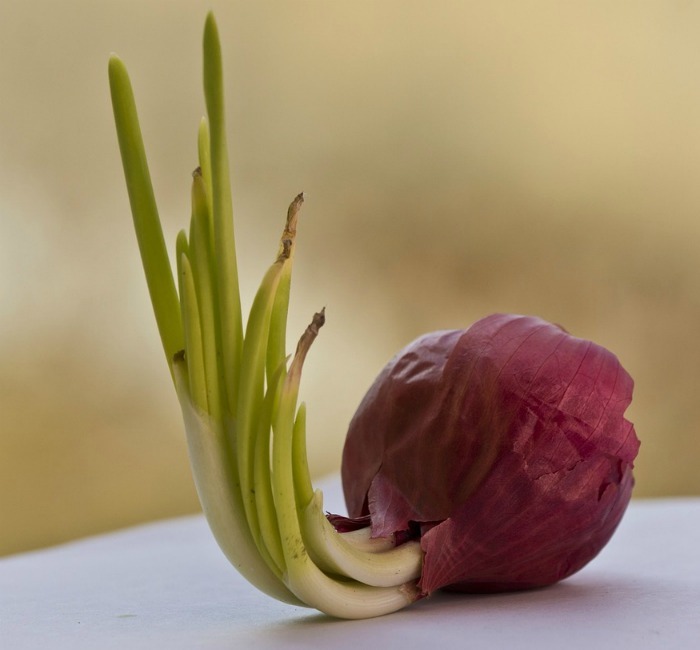 Growing onions from discarded bottoms will give you an endless supply of onions, in time. You may never ever have to buy onions again! This is great news for anyone who uses onions as much as I do. One bottom will grow and be able to be divided into several plants. You can grow some in pots and if you have the room, the others can be planted in the garden. Before you know it, you’ll have a garden bed full of onions growing. All onions will sprout easily. If you find one like this, you can plant it right into soil and get a head start. 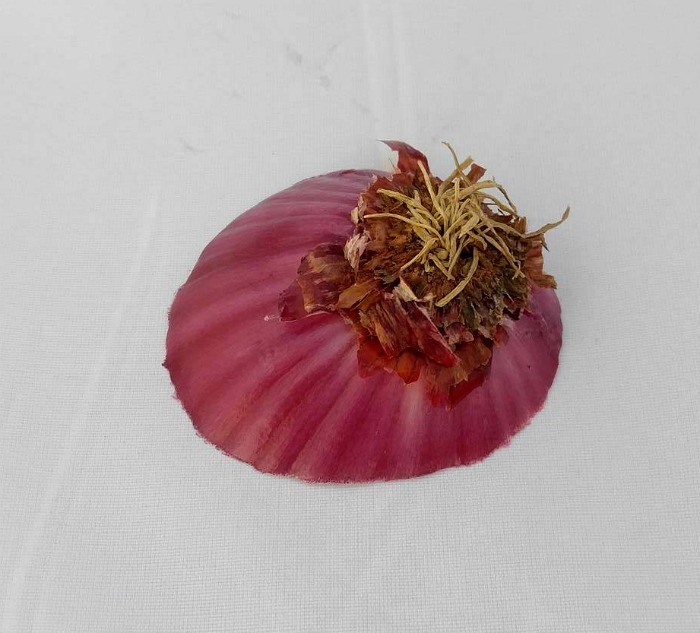 For my project, I used just the bottom piece of an onion. 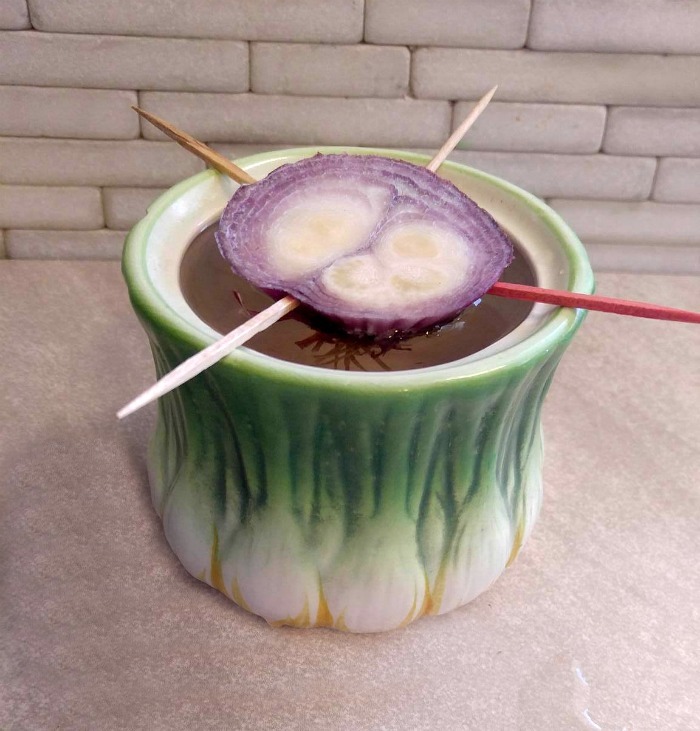 Once you have your onion piece, let it dry out for a little bit so that it will be more calloused on the top part. 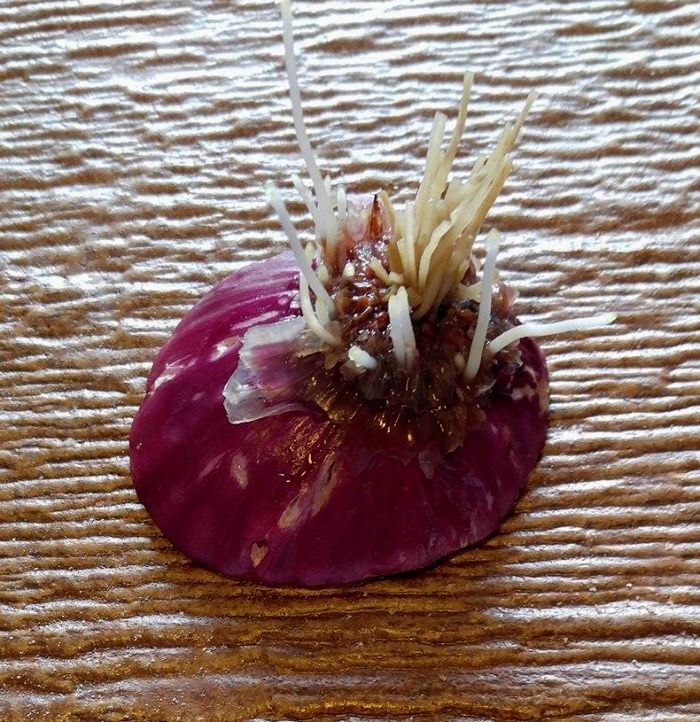 I decided to give my onion a head start on rooting by suspending it over water for a few days to encourage the roots to grow. Change the water every few days and roots will start to grow. This might happen in less than a week, depending on the time of the year – mine only took about 4 days! The whitest roots showing are the new roots. Seeing them shows me that the onion is now a living thing! I chose an 8 inch pot so that it will be big enough to hold the roots which are already quite a good size.. Add some pine bark chips in the bottom of the pot for drainage. Fill the pot with a well draining light potting soil. 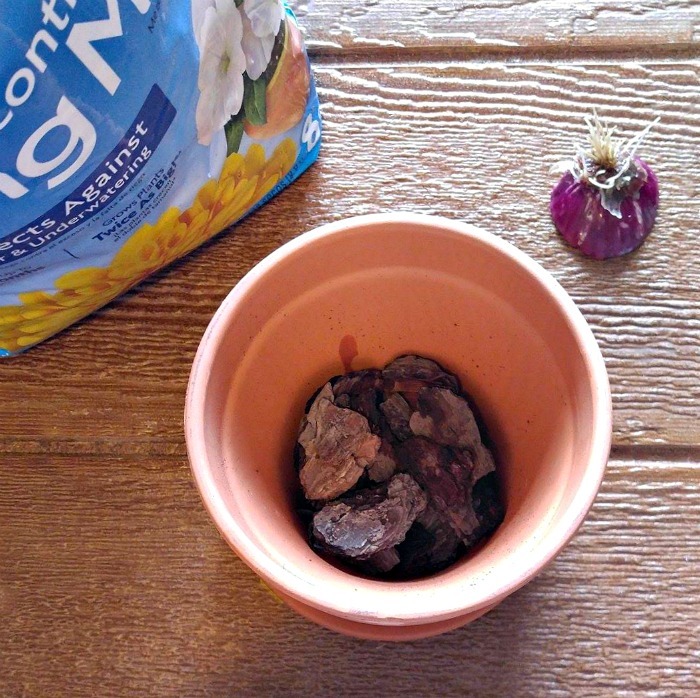 I chose Miracle Grow Moisture Control Potting mix that is very light. Water well and then make an indentation in the soil about the size of the onion and deep enough for the roots to sit. Place the onion in the soil and push the soil well around the roots. Place in a sunny spot for a few weeks. You will want to keep the soil evenly moist but not really wet. I just touch the top of the soil and if it’s dry about an inch down into the soil, I give it more water. It didn’t take long for me to see growth at the top. The first leaves appeared in five days on two places on the onion bottom..
And after a couple of weeks I had some vigorous growth. Now comes the fun part of growing onion bottoms. 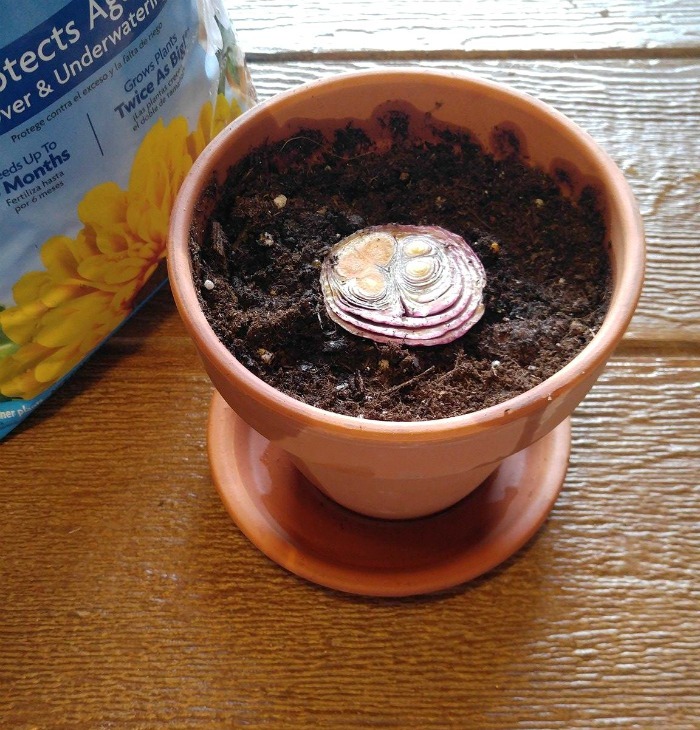 This is how you get more than one plant from a single onion bottom. You will likely have lots of roots growing and some leaves growing on top. Remove any old onion scales and use a sharp knife to slice the onion bottom into several plants, leaving a portion of the roots as well as some leaves attached to each plant. 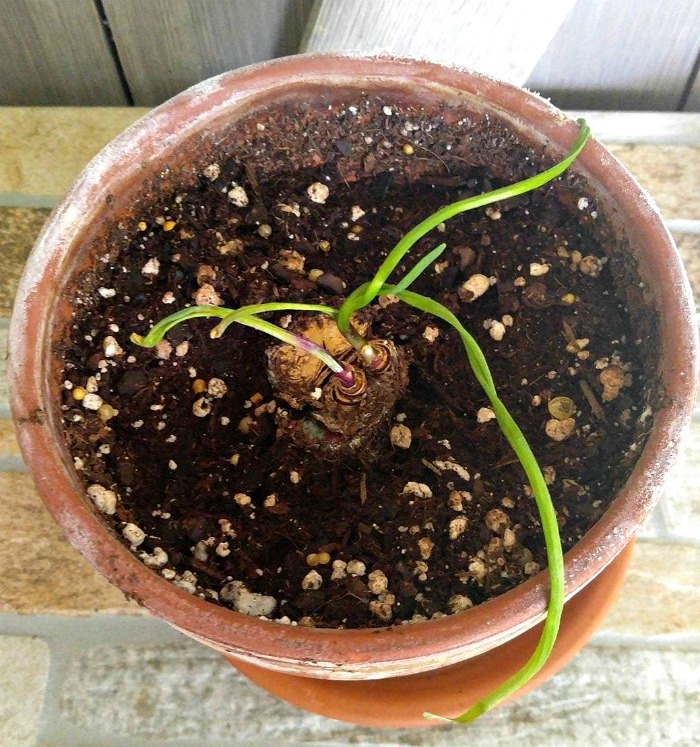 The other side of my onion did not grow, so I removed that and planted each piece of onion bottom in its own pot in a more enriched soil (the soil that I used before was very light and dried out quickly.) I now have two onion plants growing from one onion bottom. I cut the onion growth down a little to make it less easier on the plant after division.The new plants will need some time to recover and trimming the leaves allows the new plants to grow with less stress. You can harvest the plants either as green onion tops, or let them grow into fully developed onions. NOTE: It can take quite a while for a mature bulb to form. You will know that it is ready when the stalk starts to yellow and lean over, which may take 90 to 120 days. Have you ever tried growing onion bottoms? How did your project work out? Do you have any tips to share with our readers? 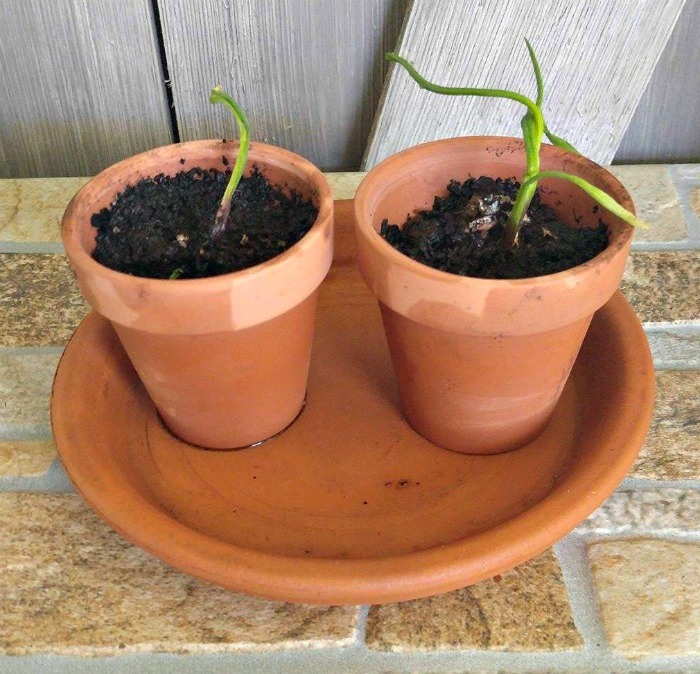 For more Gardening Hacks, see my Pinterest Garden Art board. And for more Cut and Come Again veggies, check out this post. If you liked this project, why not try to grow onions indoors in a water bottle? Onions are one of the easiest herbs to grow. 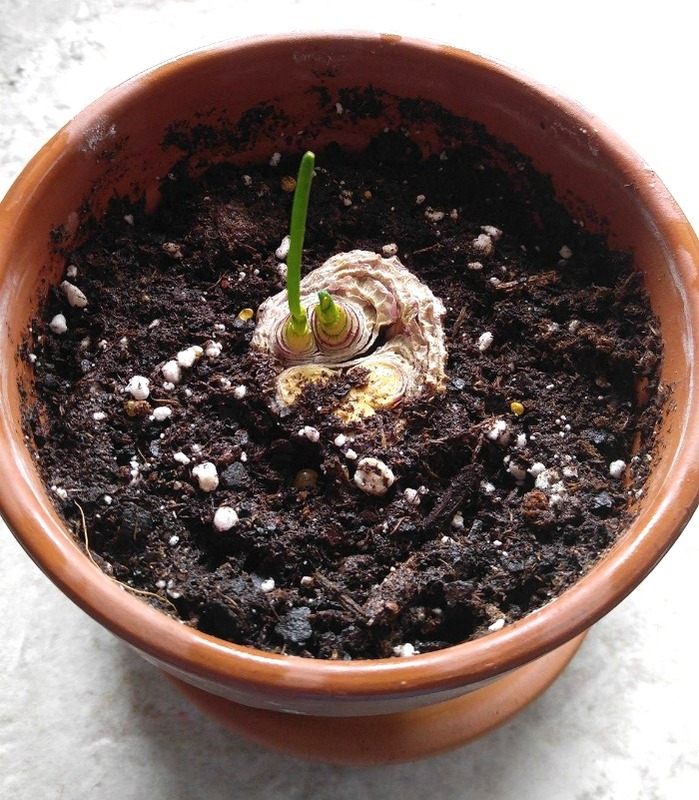 We bought spring onions in the market,cut and use the leafy/stalk part, then we planted the bulb. Now, we have so many spring onions in the garden.